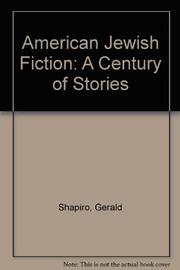 paper 0-8032-9252-X Shapiro’s vigorous and highly entertaining collection of 23 stories forms a valuable complement to Ilan Stavans’s current Oxford Book of Jewish Short Stories (p. 1327). Though some better-known contemporaries are represented by such perhaps overfamiliar pieces as Saul Bellow’s “A Silver Dish” and Cynthia Ozick’s “Envy,” Shapiro also offers such unconventional delights as a fine, wry Bernard Malamud story (“The Lady of the Lake”) and Philip Roth’s “On the Air,” a dazzling display of verbal comic energy that first appeared nearly 30 years ago in Theodore Solotaroff’s American Review. The selections are uniformly well chosen to portray familiar component parts of the Jewish-American experience: immigration, Holocaust survival, assimilation, generational conflict, and the hard-fought preservation of traditional culture. One regrets the omission of writers like Daniel Fuchs and Lore Segal, but appreciates the vivid presences of Steve Stern (his frisky “The Tale of a Kite”), Robin Hemley (whose ironical “The 19th Jew” is a beauty), Melvin James Bukiet, and the precociously gifted and justly acclaimed Allegra Goodman. There isn’t a dud to be found in this consummately readable anthology.